Be Charlotte, aka enfant fantastique of good vibes and spoken word pop, Charlotte Brimner, is considering the responsibility being a role model entails. Turns out, it's all about authenticity; the sense of being genuine is important to Brimner. After learning to play guitar at 14 and deciding two years later that music was where she wanted her career to go, she's spent the last three years honing her skills and working out where she, and her music, fit in. 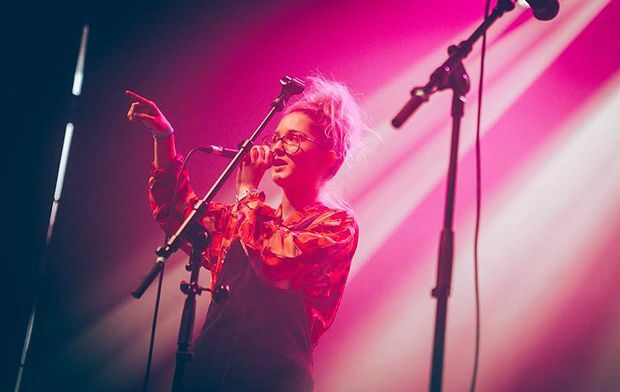 As is characteristic of Brimner's relentless drive, in her attempt to create this sound she left school at 17 and took off for America where she wrote and wrote and did some open mics and rejected the concept of a normal life for a Dundee teenager. The novelty of America and the liberation it granted Brimner resulted in a change from the relative safeness of acoustic singer-songwriter she'd been playing with to where she's at now: rapping, beatboxing and breaking boundaries. James Smith on keys and bass plus Jack Boyce on tubs complete the trio and together the three summon a live show that's all thumping beats and momentum, driving ever forwards, Brimner placing herself on a pedestal front and centre to hammer home the importance in the words she's spitting. For a taste of what she has to say, her single, 'Machines that Breathe', a magnetic pop anthem, comes out in October. As for what the future holds, there's Glasgow's Tenement Trail in September, a south-east Asian tour in October, followed by a London gig and a little tour back up to Scotland, finishing in Stirling. Be Charlotte plays the Tenement Trail, Glasgow, Sat 8 Oct. 'Machines That Breathe' is released on Oct 7 via Kobalt. Full-day Indie Rock music festival featuring over 50 bands across 10 venues.